As Pewdiepie the 22-year old Felix Kjellberg is the largest Swedish Youtube phenomenon ever. His movies sometimes has 4.2 million views – a day! The whole world’s Youtube viewers watch more of Pewdiepie than Justin Bieber, Rihanna and Kate Perry. When I get hold of Felix Kjellberg, he is shopping in an Italian Ikea, trying to find a nice chair and a new desk. He wants to sit a little more comfortable when he’s working with his movies. For the summer he has left Sweden for Italy, where he lives with his Italian girlfriend Marzia Bisognin. Felix Kjellberg explains that he recently has not been sitting comfortably . But on Youtube, he is. No one in Sweden comes even close to his popularity, whether they are called Swedish House Mafia, Avicii or H & M.
In fact, everything is moving so fast that even internationally very few beats him. Last week Felix Kjellbergs movies – in which he with a great sense of humor is commenting his own efforts in computer horror games – got 29.2 million views worldwide, according to statistics from research firm Vidstats X. Compare that to the numbers last week for the currently most popular pop artists on Youtube: Justin Bieber, Rihanna and Kate Perry. They got around 16 million views. But for Felix Kjellberg it is more important that hís numbers were greater than the American Toby Turner. – He also has a gaming site, but have been going on for ages and is one of the guys that I’ve watched a lot. It’s great. I never thought that. When I wrote about Pewdiepie the first time in late March this year, his channel had 68 million views, three months later it has 243 million. His channel gets 10 000 new subscribers every day, and has reached the magic one million ”bros” – as he calls his fans – this week. Felix Kjellberg can’t explain why it is taking off so fast right now, but he can guess. The statistics from last week speak a different language. The chart of producers with the most viewed videos on Youtube is topped by Machinima, a video game channel operated by the company with the same name, acknowledged in news stories by CNN and Los Angeles Times. The company calls itself ”The number one entertainment channel on Youtube,” has it’s headquarters in Los Angeles and has about 150 employees. 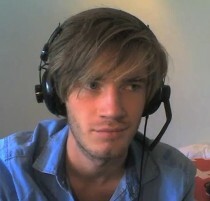 Pewdiepie from Gothenburg, Sweden, is second on the international list of most viewed videos on Youtube of the week: 1) Machinima, American game company 18.5 million 2) Pewdiepie, Swedish gaming site 18 million 3) Muyap, Turkish music channel, 17.4 million 4) Rihanna , pop artist 16 million 5) Justin Bieber, pop artist 15.7 million 6) Katy Perry, pop artist 15.5 million (Source: Vidtstats X). With 236 million views since the first clip he put out just over two years ago, Felix Kjellberg is the unchallenged king of Youtube in Sweden. Of the 30 most viewed Swedish-produced clips in the past month Pewdiepie produced 26 (Source: Youtube Charts).